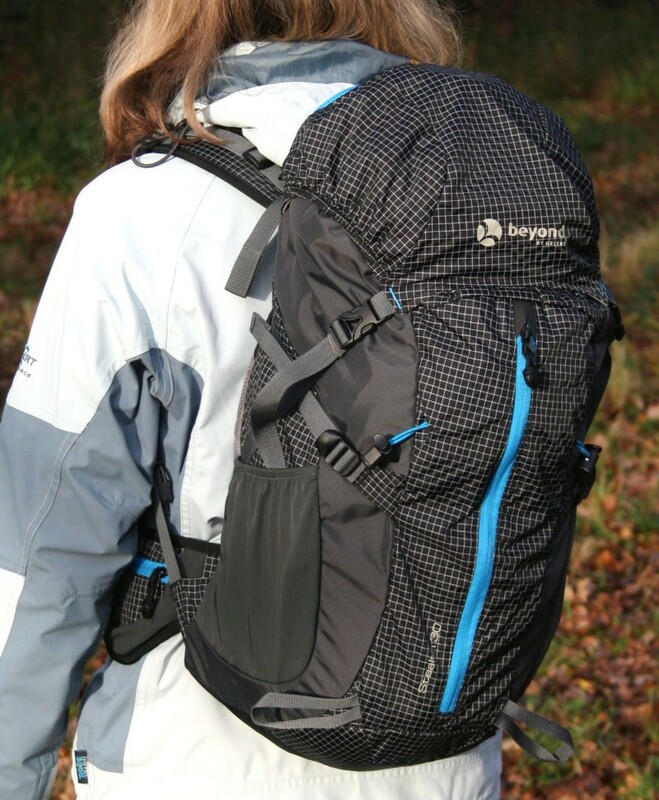 The Stealth 30L rucksack from Gelert is part of their 2011 Beyond range, and is positioned as a lightweight, technical bag, geared up for walking and scrambling. At 0.85k that sounds great, but how will it do in our tests? 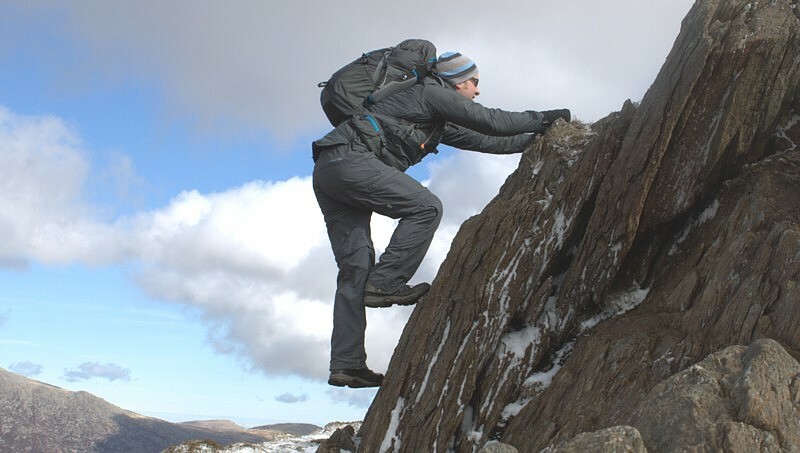 As this rucksack is tailored towards scrambling, we decided to test it out scrambling in Snowdonia. When you put this rucksack on it becomes obvious that the aim of the bag is to be tight to the body to help with scrambling, but not enough to restrict movement. Similarly to the other bag we have tested in the range, the shoulder straps feel comfortable and wide enough to spread the load, but not too wide that they rub or make you feel like you are strapped in with no escape. Once fully done up this rucksack feels very comfortable and I hardly noticed I was wearing it, even whilst scrambling over the rocks and with the odd gust! 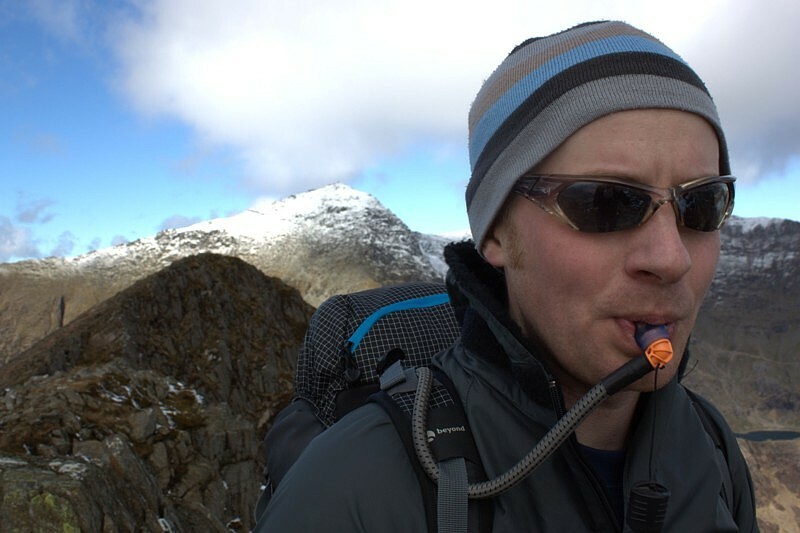 Having a hydration system in the middle of the rucksack also helps balance the pack out nicely on your shoulders. The weather on test day looked changeable so I packed the rucksack to full capacity with warm layers and waterproofs, and even at full capacity it felt secure when strapped up. The two shoulder straps and waist straps feel like they mould to your body and do flex somewhat allowing them to fit over or around clothing you already have on. With a small strap across the chest from both the shoulder straps its easy to adjust the tightness too. This rucksac also has two additional straps which tighten the bag down to minimise any empty space inside where things can move about. Making the bag as small as it can be on the day could help you squeeze through gaps and avoid hooking it on rocks or bushes. Whilst scrambling, the rucksack felt like it was hugging my back well, but didn’t restrict me very much at all. It didn’t feel like I was off balance at any point and whilst bending over it didn’t feel like it wanted to pull you over in any direction. It basically felt secure. 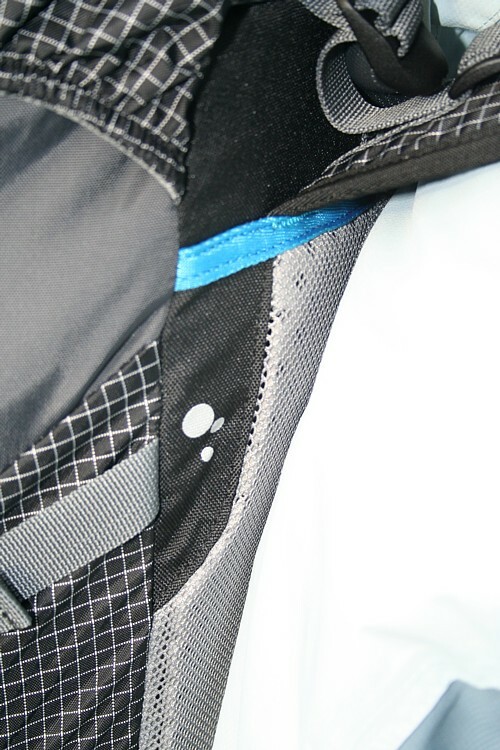 Lightweight ‘Polyester baby ripstop’ materials are used where possible in this rucksack and this material feels light and thin but also tough. The stitching in the rucksac looks sound and even looks double stitched in places. The buckles used to secure the top of the rucksac on the back are lightweight but look well made, and there are an additional two for tightening up. They do work well, although they are relatively small and I found them a little more tricky to do up when I had gloves on. Some of the straps are partially covered by rubber which also helps stop things catching on them. There is no waterproof cover on this bag, instead relying on the Nylon Ripstop/Plain Nylon material being water resistant. We had a full afternoon of showers as we headed across one peak and got a complete soaking. I noticed the rain was beading of the rucksack nicely and on returning back to the car I was pretty amazed to retrieve a dry map from the top of my bag that I had forgotten was in there. The material had done its job, which is more than can be said for my waterproof trousers! The rucksack has a hybrid vent system which is basically an EVA foam layer full of small holes, which has been split in to three parts, one resting against your lower back and two resting on each shoulder blade, leaving a T shaped gap for air to circulate. This seemed to work well, but will really be tested in the hight of summer! There are a number of handy pockets, the handiest for me being a zip-pocket at the top of the bag. There is plenty of space here for stashing away stuff you need faster access to, like sunglasses, snacks and gloves. There is a flat pocket on the front of the bag with a zip running down the length of the bag. There is enough space to pop an OS map and pair of gloves in here and the pocket is also easily accessible. There are two stretched nylon side pockets for spare clothing or water bottles and these both have an elasticated top to hold things in better. There are also two expandable zipped pockets on the hip belt which are excellent places for snacks, compass or small things. There are secure walking pole attachment points on the back of the rucksack, and although small and simple, were effective and easy to use. This rucksack has a pocket sewn in to the inside of the bag for stowing your hydration pack and a handy velcro strap for attaching it and holding it in place. Your water tube will then fit through a purpose built hole in the middle of the bag around the neck line which has an elasticated entrance to stop the weather getting in. I had no problems using this and when the nozzle was positioned on the shoulder strap I hardly noticed it. This rucksack has a RRP of £49.99 and like all Gelert rucksacs in this range seems reasonably priced. Overall I think that if you are looking for a rucksack that is affordable, comfortable and lightweight this is a good choice. You often trade off lightweight for durability, although I think this bag has struck a good balance of the two. This rucksack really doesn’t feel like its getting in your way when your scrambling and after the soaking we had on one of the days, I was amazed to pull my map out dry! When your scrambling you need to be confident with the kit your using, and I really didn’t have to think about the rucksack too much on the day, just about where my hands and feet were going. I’m optimistic this rucksack would do well in the warmer months when the Hybrid Vent will be more important. Watch this space!